The new organ is based on a soundboard found at Wingfield church in Suffolk (hence the name). The surviving fragment cannot be dated accurately. There is as yet no possibility of tree-ring dating. 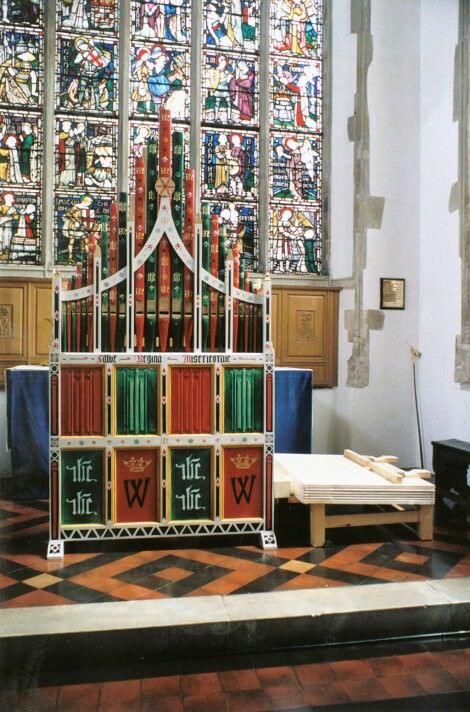 It has sliders, and the first reference to stops in an English organ is at Westerham in Kent in 1511/12, where the organ was ‘to be made with iii stoppis after the new making’. It is unlikely to have been made after 1560, or between 1547 and 1553. The 1530s and 1540s seem most likely. The assumption is that this soundboard always lived in this church, and that it was the organ which was seen in 1796, standing on the north side of the chancel. It seems likely that this organ was made by a local builder, from local materials. Builder: It is known that there were continental organbuilders being paid for new parish church organs in the first half of the 16th century in England, but the indigenous characteristics of this organ suggest that this organ was made by an English builder, probably fairly local, since there were some well-known East Anglian builders. These characteristics can be summarised as: long, fully chromatic key compass, chorus of wooden pipes of the same scale and style, each with its own slider, and a voicing style familiar from 17th century English organs. Stoplist: The pipes are all open, and made of oak. The pipes in the front (and the back) are the Principal, a 5ft rank, the inside pipes consist of two Octave ranks and two Fifteenths. The Principal has no slider, but the other four ranks can all be drawn separately. The pitch and scaling of the stops are indicated by the spacing and the toehole sizes on the old soundboard. Key compass: The key compass is F to a² without g#², 40 notes, which is the number of grooves in the Wingfield soundboard. This compass is derived from the ranges needed for the repertory. The two C organs at All Hallows by the Tower in London (1519), and Holy Trinity Coventry (1526) would also have had an upper limit of a². Pitch: The nominal pitch is 5ft, i.e. a fourth above singing pitch. 5ft Principal ranks were the basis of the two organs mentioned above. For the actual pitch I have chosen the pitch of the earliest unaltered English pipes (the dummy pipes of the 1630 Dallam organ now at Stanford on Avon), which are about 1½ semitones above A440 at singing pitch. Tuning: The tuning system is a modification of the Erlangen tuning, suggested by Annette Otterstedt. This is a Pythagorean tuning system, based on pure fifths. The wolf fifth is placed so that there are some useful good major thirds, and the effect of the wolf fifth is reduced by dividing it over two neighbouring fifths. Although there are bad fifths on d-a and a-e, there are good thirds on d-f#, a-c#, e-g# and b-d# (the last not in practice very useful), which influences some finals, though not perhaps to make an argument for such a modified tuning over strict Pythagorean. height including pipes 261cm tall 102"
ground plan of the case 127cm wide x 43cm 50" x 17"
ground plan of the wind system 107 x 96 42" x 38"
staging (= total floor space required) 244 x 122 96" x 48"